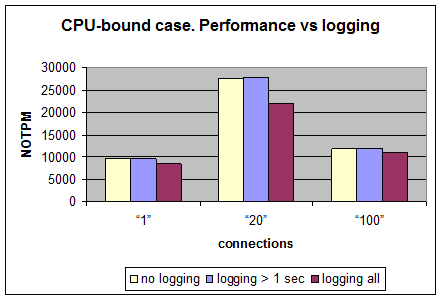 When people think about Perconaâ€™s microslow patch immediately a question arises how much logging impacts on performance. When we do performance audit often we log every query to find not only slow queries. A query may take less than a second to execute, but a huge number of such queries may significantly load a server. On one hand logging causes sequential writes which canâ€™t impair performance much, on other hand when every query is logged there is a plenty of write operations and obviously performance suffers. Letâ€™s investigate how much. I took DBT2, an OSDLâ€™s implementation of TPC-C. There are four CPUs Intel(R) Xeon(R) CPU 5150 @ 2.66GHz, 32GB RAM. There are 8 disks in RAID10(a mirror of 4+4 striped disks). There were two cases considered CPU- and IO-bound. 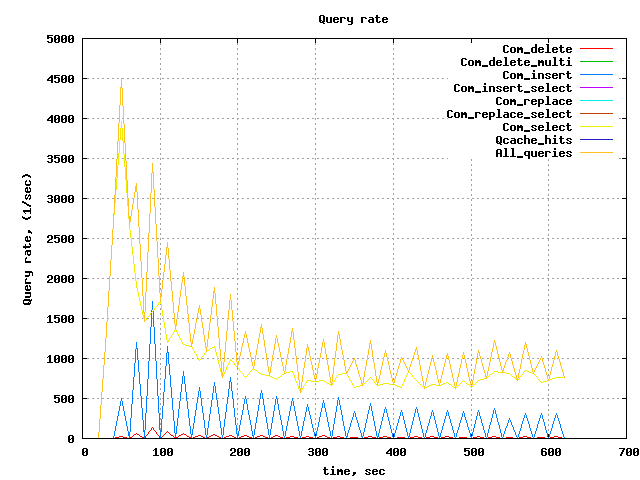 Depending on workload different InnoDB buffer was used. For CPU-bound case number of warehouses was 10(1.31GiB). In case of IO-bound load â€“ 100 warehouses which is 10GiB in terms of database size. To reduce random error the test was run 3 times per each parameter set. The metric of a DBT2 test is NOTPM (New Order Transaction per Minute) â€“ the more the better. 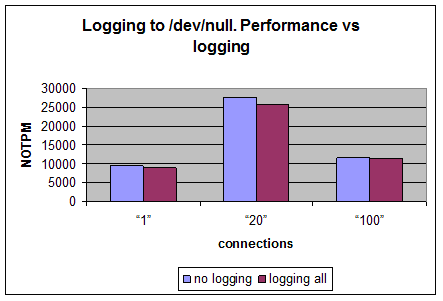 We see here that logging all queries decreases MySQLâ€™s performance on 6-20% depending on a number of connections to a database. It should be noted during the test it was executed roughly 20-25k queries per second. If all queries are logged â€“ a slow log is populated at rate about 10MB/sec. This is the highest rate observed. In this case every test was run 5 times and random measurement error was calculated. As it is seen from the chart above the performance almost doesnâ€™t depend on logging â€“ the difference doesnâ€™t exceed the measurement error. The query rate in this case is about 1000 per second. It is interesting to know how much from performance degradation caused by the microslow patch itself. Letâ€™s do the same tests but logging to /dev/null. It is safe to log slow queries with execution time bigger than a second without worry about performance impact in case of CPU-bound workload. 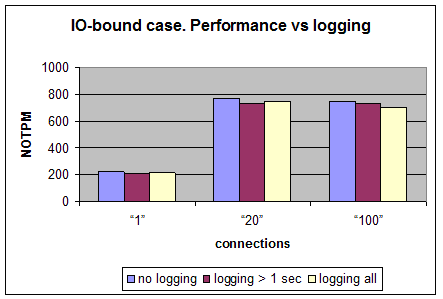 The performance impact is negligibly small in IO-bound workload even if all queries are logged. In general logging all queries can hurt MySQL and you should consider the load while using it, especially in CPU-bound case. So nothing new really, but good to have the numbers. Thanks! I think this benchmark shows that a) in cases where you’re I/O bound, which is exactly the time when people worry about the impact of logging, it isn’t measurable, and b) it’s not that much overhead anyway. Interesting your point to Cary Millsap blog. I think his Book on Oracle Performance Optimization is one of the best books on performance tuning. It surely taught me a lot when… And a lot of principles are general being it Oracle or MySQL just tools (or lack of tools) is different. What about logging queries like INSERT INTO binary_table VALUES (123, ‘%LARGE_BINARY_BLOB%’)? I’ve found some time ago that for PostgreSQL logging such queries takes more time (and uses a lot of CPU) than this insert executes. This whole topic is one of the reason’s we’ve always been so excited about dtrace. I wonder, perhaps you guys should query the mysql developers to get a copy of their dtrace probes patch for 6.0, and put it into OurDelta now. Probes are pretty non-intrusive; we’ve done them for both Apache and Postgres on our own (though we worked with Sun to get the Postgres ones into core for Postgres 8.4). Dtrace is cool. The thing is though very little of our customers runs Solaris. I worked w Sun on Dtrace support for MySQL during my time there. The whole question is a non-issue. Turn on the slowlog, and leave it on. Why do I say that? * If the system is performing well, then, by definition, the slowlog is not hurting. * If the system is performing poorly, then you need to look back at what was causing the most pain and fix it. And the slowlog is the best way to do that. When there is a meltdown, the slowlog is sometimes the best source of ‘why’. The rest of the time, I find it useful to proactively look for naughty queries and propose tuning / index / schema / design changes. Slow Query should be run on as-needed basis, and re-actively not pro-actively. I’ve actually see worse performance caused by slow query turned on, especially for very large (but not necessarily slow) queries. It’s a good tool but it should only be used when needed, and that’s why it’s turned off by default. This post is over 6 years old, I bet MySQL and Percona have changed alot since then to make these numbers obsolete. Is there a more recent look at audit logging overheads anywhere?